As a rule, the quality of the food at Luby's Cafeteria increases the closer you get to San Antonio, which is their home base. Seriously, I've had some meals at Luby's locations off of McAllister Freeway that were better than the Ritz Carlton! 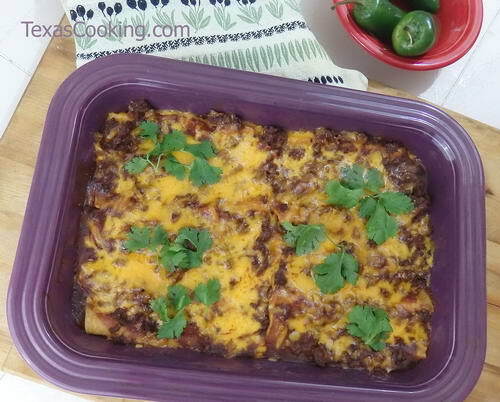 For many of us, it's not as easy to get to one as it used to be, so today's newsletter is one of their most popular menu items - cheese enchiladas with chili gravy. Luby's has some good enchiladas. Preparation: Preheat oven to 350°F. Spray a 7x11-inch baking dish with cooking spray. If you do make this in advance, set it out about a half hour before serving so that some of the chill is taken off. Readers may also enjoy our recipe for guacamole, and a special article on chips and dips. .
Fort Worth Stock Show & Rodeo Jan. 18 through Feb. 9: This activity can be a daylong diversion at the Stock Show. TM BBQ: Recipe: Instant Pot Queso with Beef from Paula Forbes. Dinner a Love Story: The Green Beans and Egg Thing. NYT Food: How to Make a Very American Mango Pie - with recipe! Addie Broyles: My dad didn’t cook much, but he could do anything, including the next right thing. Homesick Texan: Pork shoulder roast with garlic, citrus, and herbs recipe. Saveur: Why you should be using allspice at the dinner table - Chances are you have a jar lying around with your baking ingredients. Lubbock Avalanche Journal: Buddy Holly Center hosting new exhibit through September.